The thing I like about animal printed pieces, is the fact that they are such statement pieces on their own, they don't really need that much styling. In fact, I believe they look the best with very basic and clean pieces, preferably in basic colours such as black and white, that really emphasize the central statement piece, in my case these awesome leopard pants, that (with leopard print being one of the hottest prints for the upcoming fall) I think you'll be seeing here on magnifique quite a lot! Your are very stylish in this outfit. Love these photos as always. Oh, it looks pretty cool! Le gilet est canon ! so cool!! love those leopard print trousers!! Love our outfit and I'm also a fan of leopard print! Very nice blog, should visit more often! your shoes are awesome ! You have amazing fashion sense, I love this outfit. Love the pants and vest. 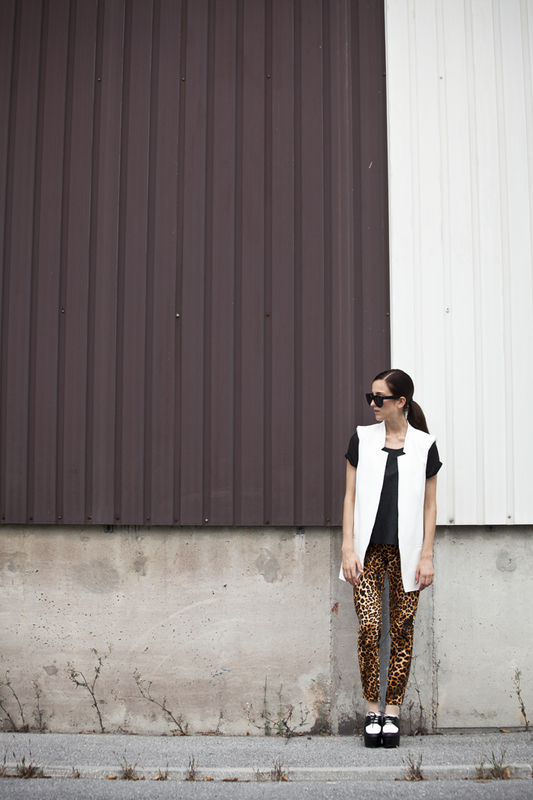 I usually despise animal prints, but that pair of leopard pants matched really well with the minimalist ensembles. Super cool!